Another baseball season is upon us, and fans are quick to project the results of their favorite team from the first few games. I wondered if many teams tend to arrive at a winning percentage near their whole-season results, and then oscillate around a little, versus having early results that differ substantially from the final winning percentage. 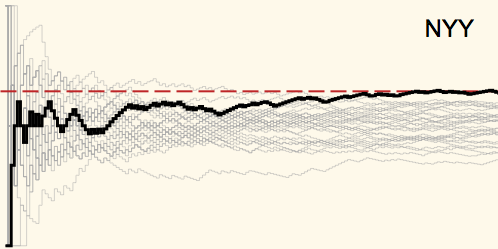 I created an interactive plot to look at the results for the 2009 season, team by team. Take Boston. Seen below, Boston started slow, but pretty quickly arrived at their ultimate winning level. On the other hand, the Yankees started even slower, and in fact didn’t reach their ultimate winning level until very late in the season. See the results for the other teams on the visualization page. but extended to afford exploration of a shallow, two level hierarchy of time series. I visualized the transit time via the MBTA’s Red Line to park street from points within 1.5 miles of Red line stops on a google map. More information, and the interactive google map on the project page. I’d thought about doing this before, but it would have taken screen scraping schedule information off the site. I learned recently through a developer outreach that the Massachusetts Department of Transportation is running that the MBTA had released their schedule information in the Google transit feed specification (GTFS). With the data in hand, I went to work using the ruby-processing wrapper of the excellent Processing graphics toolkit. I put together an animation of all the rail traffic in the course of a day on the MBTA’s red, blue, green and orange lines, including the Matapan . Its a great way to see just how complicated the system is that takes me to work every day, and perhaps be a little more patient next time things go wrong in the system! The current version of the animation assumes stop take no time (as does the scheduling data). I put together an animation of all the rail traffic in the course of a day on the MBTA’s red, blue, green and orange lines, including the Mattapan line. Its a great way to see just how complicated the system is that takes me to work every day, and perhaps be a little more patient next time things go less than perfect! 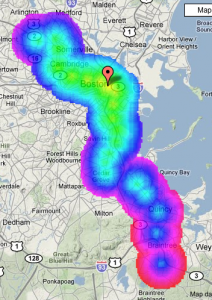 Following up the surprising success of my first MBTA visualization, I made a new version that adds the commuter rail lines. This does have the unfortunate effect of squishing the system’s rapid transit lines because I’m not distorting the distances in any way. I also reduced the size of the markers, perhaps too small for viewing at youtube resolution unless viewed at full screen. Also, for Frank and Elias, I made the length of the video shorter, enlarged the numbers, and added a little visualization showing active trips sampled at 5-minute intervals with a you are here indicator to give viewers perspective on how busy the system is at that moment relative to the whole day. I’m James Kebinger, currently a Software Engineer at PatientsLikeMe. I’m James Kebinger, currently a Master’s candidate in Computer Science at Tufts University in Medford, MA. I’m also an experienced Software Engineer and Web Developer with a variety of skills including Java and Ruby/Ruby on Rails. A couple of weeks ago I had the good fortune of sitting in on lecture of a scientific visualization class* at Tufts at which Ben Fry, creator of many great works of visualizations that can even be called information art as well as the visualization toolkit, steroids Processing, was guest speaking. The talk was great, spanning lots of work and interesting commentary. 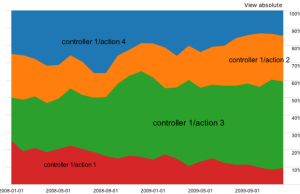 Ben showed quite a bit of his previous work – some of it would be familiar to readers of his book, Visualizing Data. Showed off some of his work that has appeared in movies, highlighting the fact that he is asked to add rows of standard grey computer buttons to his work because it doesn’t look “real” otherwise. The coolest demos were of some of the work he’d done for Oblong Industries (Not a lot of information online now- here’s one cnet article)- they have a working Minority Report-style gesture interface that allows one to control a computer with hand movements. Paired with the right interface, this looks to make light work of navigating through vast amounts of multidimensional data. Ben showed some videos, along with a demo (running on his macbook pro w/o the fancy hardware it was still really cool). * I’d been asking for a class like this to be offered several times while I as still working on my degree at Tufts, but to no avail. Of course it’s offered right after I graduate! I love this interactive graph showing the margin of victory in each of the primary states for Clinton and Obama. It blends a histogram with labeled blocks to really effectively illustrate the data. The animation between different views of the data puts it over the top. I noticed this morning that google finance has a new stock screener feature that lets you choose stocks with features in a certain range by way of an interactive sparkline. These are miniature graphs that go inline with text. In this case the graph is a histogram that indicates how much of the stock market falls into each part of the range – this will give one a quick preview how inclusive their search parameters are. How special, special interest money? Oil change international put together a great tool to visualize the flow of money from oil companies to presidential candidates and congressional representatives. The graph view of the presidential race is sort of what you expect, with republicans soaking up more oil money than democrats. What interests me about the data though, is what makes a donation from someone who works at an oil company “oil money”? Where do we draw that line? It would seem that a matched pair of max $4600 donations from the CEO and (homemaker) spouse are on one end of the special-interested donation spectrum, but what of a $500 donation from someone who owns a gas station, or a pair of $500 donations from a research scientist? For me, I think the inclusion of some of the donations as oil-money are disingenuous, but its hard to say which donations are or are not to be included. Maybe one day we’ll see public campaign finance and no one will have to figure that out? Posted on February 22, 2008 February 24, 2008 Author James KebingerCategories Politics, visualizationLeave a comment on How special, special interest money? 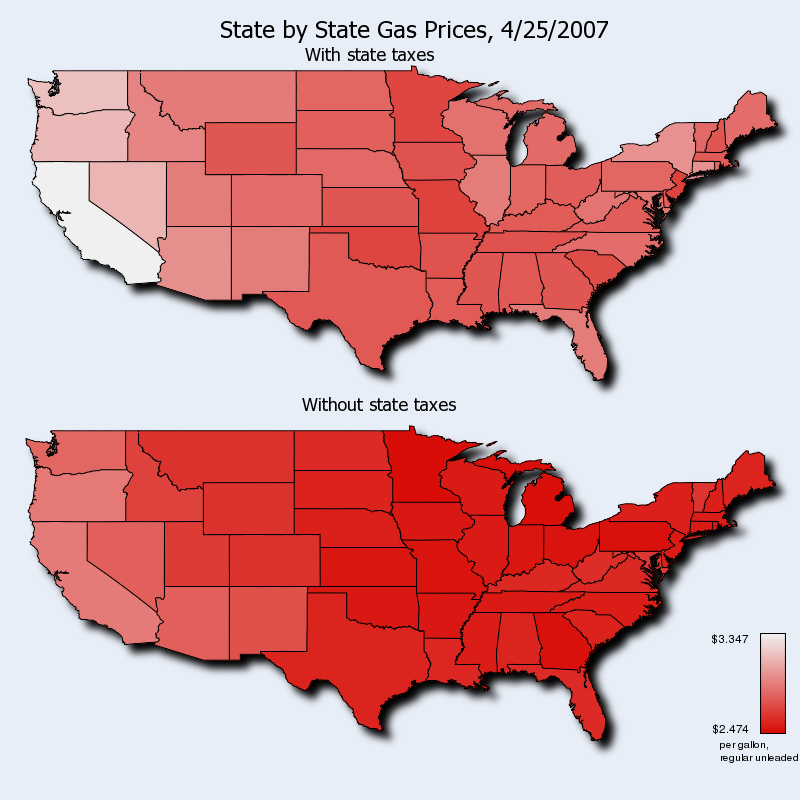 In the image below I’ve plotted the average gas price in each state for 4/25/07 (data from here) with and without state per-gallon taxes included. Without the taxes included, it becomes obvious that gas prices increase on the west coast, perhaps due to transportation costs? ( a quick search didn’t turn up any port-by-port oil import stats). I created this using ruby-shapelib and rmagick as mentioned previously.